AminoA Pro is a natural micro-granulated formula, completely water soluble, obtained through enzymatic hydrolysis using high quality, stringently selected sources that guarantee the final product meets the highest quality standards. AminoA Pro Is a Class A fertiliser, meets all EU standards and is approved for organic production. AminoA Pro meets Aminogram standardization requirements and contains only fully absorbable L-α type amino acids. AminoA Pro releases and reinforces different reactions in the plant's metabolism. Its mode of action has a similar effect to that of plant hormones and natural growth regulators. AminoA Pro has a significant nutritional value which complements the main bio-stimulant effect and provides significant quantities of Nitrogen (N), natural Potassium (K), readily available Iron (Fe) and Magnesium (Mg). AminoA Pro is rich in natural humic and fulvic acids over 86%. Apply in general when the crop is most active: at transplanting, flowering, formation and ripening of fruit. It is also advisable to apply in stressful situations. In principle, AminoA Pro should not be mixed with herbicides whose mode of action is the disrupt the amino-acid chain or that are known to be harsh on the crop. Do not apply in Tank Mixtures with herbicides and growth regulators at a dose rate of more than 0.5 kg ha. Generally, AminoA Pro is compatible with fungicides and insecticides BUT it is recommended to carry out a simple jar compatibility test first. When applying by fertigation do not mix with Nitric Acid. When applied alone, especially in dry conditions add an approved adjuvant/wetter. Never add directly into a crop sprayer tank, always premix thoroughly and add when the sprayer is 80% full. In the case of foaming add an approved anti-foaming agent. AminoA Pro is a Biostimulant with a high concentration of amino acids 84.4%, obtained from enzymatic hydrolysis. It can be used on all crops, including: vegetables, olive trees, fruit trees, citrus trees, vineyards, banana plantations, gardens, ornamental plants and lawns. AminoA Pro is made of 100% Active Ingredient without any fillers ot inert materials. 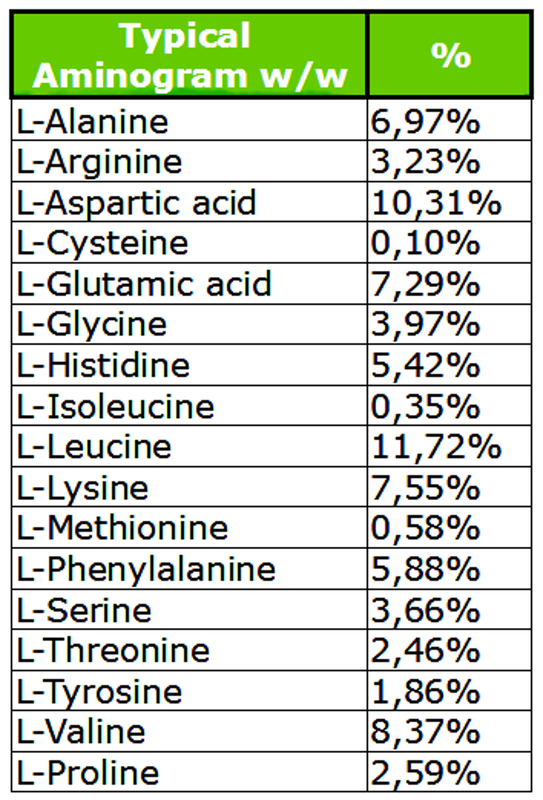 100% of the Amino Acids found in AminoA Pro are the L-type (L-levogiro). 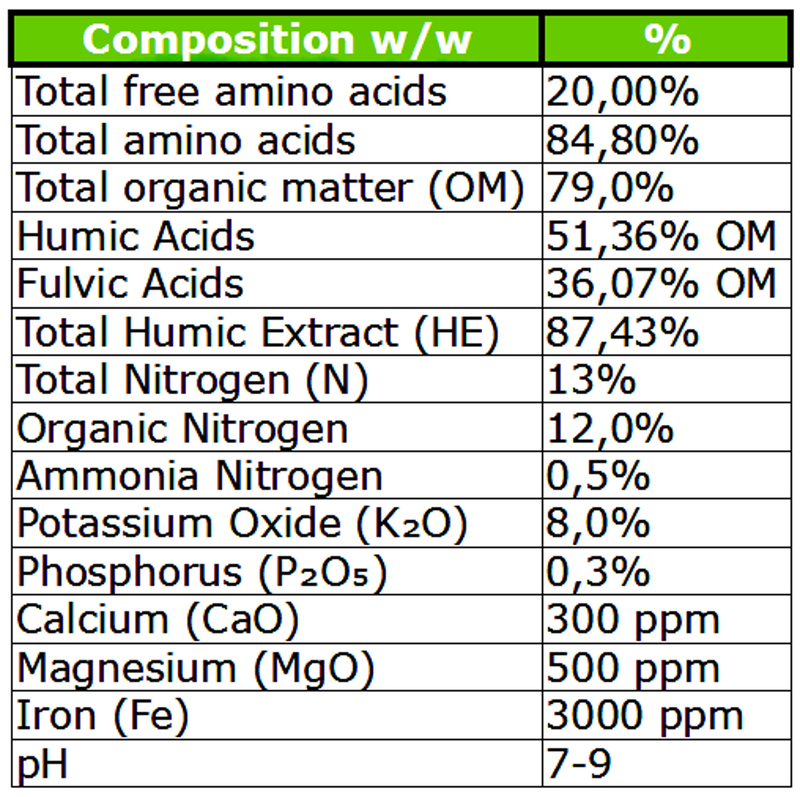 AminoA Pro also contains 79% organic matter, 13% N (Nitrogen), 8% Potassium (K2O) and 3000 ppm of absorbable Iron (Fe). AminoA Pro releases and reinforces different reactions in plant metabolism, its biostimulant action having a similar effect to that of plant hormones and natural growth regulators, as well as acting as a traditional nutrient. With its high content of nitrogen (N), natural potassium (K), absorbable iron (Fe) and magnesium (Mg) AminoA Pro has also a nutritional mode of action which complements its biostimulant effect. 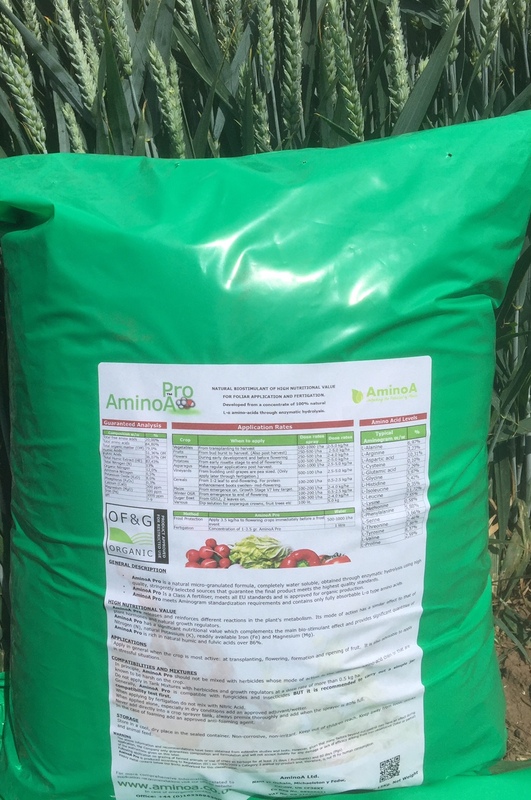 The agreed balance of L amino acids, along with a specific enzymatic process give AminoA Pro unique properties, making it the most innovative, efficient and profitable biological stimulant. AminoA Pro contains significant levels of natural fulvic and humic acids. AminoA Pro is manufactured by the plant nutrition division of an international group specialising in nutrition in the human food, health and animal sectors. AminoA Pro is a unique product intended to meet the most demanding needs of the nutrient and biostimulant sector. Increases iron and potassium levels in plants. AminoA Pro is a micro-granulated product obtained through a system of dehydration new to the plant sector, resulting in a 100% instantly water soluble product. Eliminates problems from blockages in pipes and filters in the foliar spray application or irrigation systems. Lower cost per unit of dried, bioactive matter. Optimises on storage and transport. No remains in the packaging. Minimises handling of used packaging.